Great news on the local magazine front. Tonight, after a concerted effort by publishers Ash Peak and Juliette Dudley over the last twelve months or so, Canberra is getting its own magazine to celebrate local artists, designers and photographers who work so hard to make our city a more aesthetically pleasing place. If you’re not off sipping the fine libations at Knightsbridge Penthouse this evening, head over to Smith’s Alternative Bookstore on Alinga St and celebrate another arrow in Canberra’s cultural quiver. 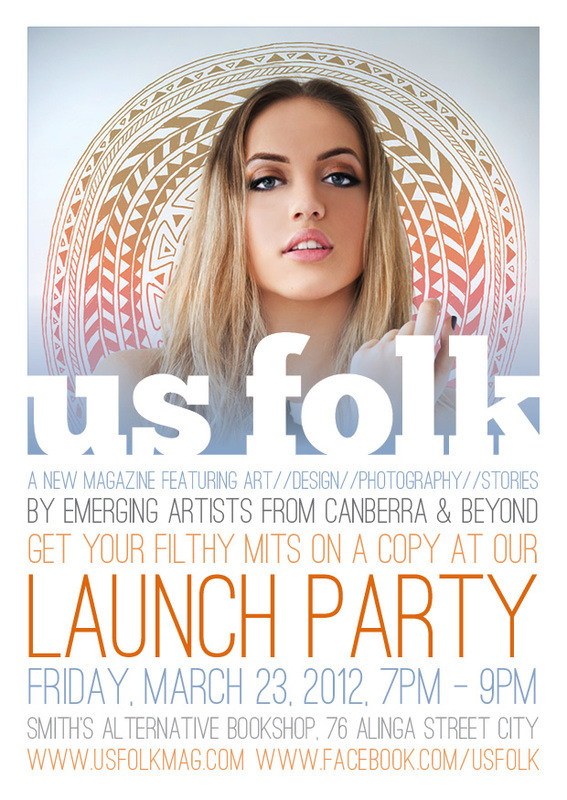 We are launching Issue #1 of Us Folk magazine at 7pm, Friday, 23rd March at Smith’s Alternative Bookshop in Civic. There will be loads of lovely people, wine, soft chairs to rest upon, nibblies, and most importantly our very first issue! Can’t wait to see you all there! Congratulations to all those concerned with Us Folk. Launhing a magazine is no small undertaking, and we at The Canberran wish them all the very best and many subsequent releases.